STOP PRESS!!! 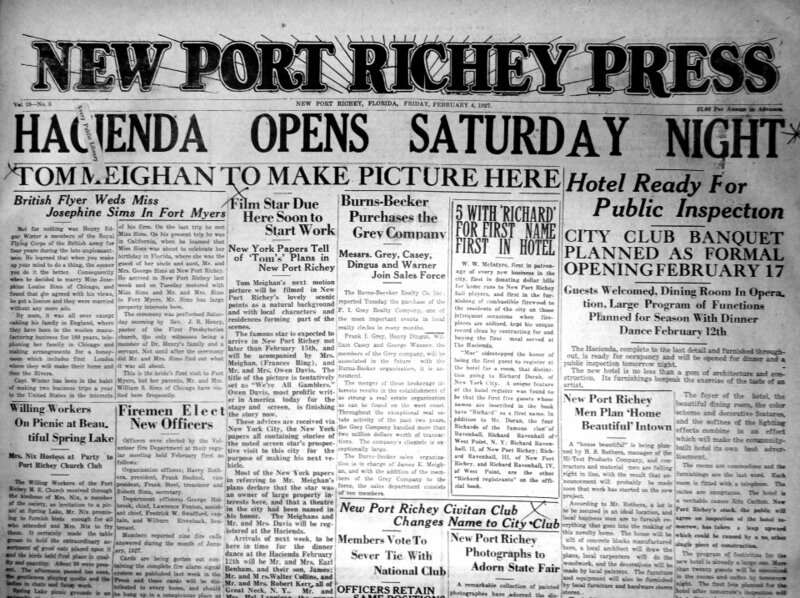 We’ve just received permission from the West Pasco Historical Society to utilize their images and histories of the Newport Richey area. We are very happy to be able to promote their content with you in order to get some more appreciation of the area we live in and things that have happened in the past. These are the experts our history and it’s very rewarding to be able to team up and get their work and our shared history known. The society has been around since 1971 and have done great work on our history. Our first article deals with the Newport Richey press (see how nicely this ties in with our Stop Press statement?) The Newport Richey press was started on November 21st 1918, so at time of writing, it has just experienced its 98th birthday just a couple of days ago. However, the earliest copy that the West Pasco Historical Society has on hand is from December 21st 1918. The above picture is taken from February 4th 1927 edition. It’s interesting to read the papers of 100 years ago, especially in comparison to how things are reported these days. There’s always a sense of eloquence, seemingly more unbiased reporting, and of course the nostalgia.